Based on the novella Glory for Me by MacKinlay Kantor, The Best Years of Our Lives is the story of three men who served in World War II as they try to readjust their lives after the war. Directed by William Wyler and screenplay by Robert E. Sherwood, the film is a study of post-war life seen by three men from different background and social classes who are forced to deal with things in the past and things around them now. Starring Myrna Loy, Dana Andrews, Fredric March, Teresa Wright, Virginia Mayo, and Harold Russell. The Best Years of Our Lives is a majestic and riveting film from William Wyler. The film is a post-war drama set in a small town of Boone City where three different men from different military branches and social classes meet on their way home as they become friends as they cope with post-war life and trying to become civilians again. There, they all endure challenges in not just returning to their old lives but also in the changes as well as the people in their past lives. Robert E. Sherwood’s screenplay explore the struggle of these three characters and how family including the women in their lives cope with this struggle to return to civilization. The characters in Al Stephenson (Fredric March), Fred Derry (Dana Andrews), and Homer Parrish (Harold Russell) are all men that lived in the same town but never knew or encountered each other as they meet at an airport on their way home where they share a plane and meet up again later that night at a bar owned by Homer’s uncle Butch Eagle (Hoagy Carmichael) with Stephenson’s wife Milly (Myrna Loy) and daughter Peggy (Teresa Wright). Al Stephenson was a platoon sergeant who has been married to Milly for nearly 20 years as he also worked at a bank as his story arc has him not just coping with returning to work where he becomes an alcoholic but also what his bank is doing for veterans who are asking for loans that they won’t approve. Derry’s arc as this soda pop jerk turned Air Force captain has him struggling to find good work as he doesn’t have much skills while his marriage to Marie (Virginia Mayo) becomes rocky due to her need of wanting more forcing Derry to befriend Peggy whom he’s fascinated by. The third arc on Parrish as a sailor who lost his hands and now has mechanical hooks copes with his family and girlfriend Wilma (Cathy O’Donnell) over his disability as he becomes unsure of what to do and being a burden to many. It all play into men dealing with not just returning home but wondering if they’re really home. William Wyler’s direction does bear bits of style yet remains very intimate in the way he captures the lives of three men returning home following their time at war. Shot on various locations in Los Angeles and Hollywood, the film does play into this air of a small town life where Wyler would use some wide shots for the locations as well as some scenes at Stephenson’s home or at the bar that Butch runs. Yet, much of Wyler’s approach to the compositions aren’t in simpler, intimate shots in the close-ups and medium shots but also to establish this air of utopia in a small town that is dealing with a post-warm boom and optimism. 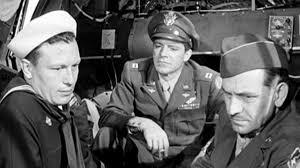 There are moments early in the film where the three men meet as they all board the same plane as they become equal realizing they all served their country for the same reasons. Even as they meet up again unexpectedly at Butch’s bar as Milly and Peggy would meet Derry and Parrish as Peggy is aware of the demons that Derry is dealing with. The direction would feel lively to play into these three men escaping from the memories of war but when they have to deal in socializing with others or trying to readjust. Wyler’s direction would showcase this disconnect of what is going on with the main characters in the foreground and others in the background. The direction would also play into the struggle of men in service as it relates to Stephenson talking to a former Naval officer who wants to make money for a farm as Wyler allows the conversation to take its time without the need to cut fast as it adds to Stephenson’s realization that he still has something to do. Even as he becomes aware of Peggy’s attraction towards Derry as she goes out on a double-date with a friend with Derry accompanied by his wife whom she dislikes for the way she treats her husband. Wyler also wanted to capture the sense of realism as it relates to Parrish and his struggles including a scene where he meets Derry at a store he’s working at where a man (Ray Teal) make some claims about the real reasons World War II happened which pissed both men off. It would add to this sense of alienation for the two men with Parrish unsure about his place in the world and being accepted for he is while Derry copes with being in an unloving marriage and little prospects about what to do next. It all play into three men and their loved ones pondering that idea if they can recapture the best years of their lives. Overall, Wyler crafts a riveting and touching film about three men dealing with post-war life after World War II. Cinematographer Greg Toland does incredible work with the film’s black-and-white photography as it is rich in its imagery to some of the scenes at night including a banquet scene and a tense meeting between Derry and Stephenson over the latter’s daughter at Butch’s bar as it is a major highlight of the film. Editor Daniel Mandell does excellent work with the editing as it doesn’t rely too much on style other than a few rhythmic cuts to play into the conversations the character has without the need to cut too fast. Art directors Perry Ferguson and George Jenkins, with set decorator Julia Heron, do fantastic work with the look of Stephenson’s family apartment to the cramped apartment Derry lives with his wife as well as Butch’s bar where it becomes a meet-up of sorts for the protagonists. Costume designer Irene Sharaff does terrific work with the costumes from the dresses that the women wear as well as the clothes that the men wear. Sound editor Gordon Sawyer does superb work with the sound as it play into the different locations as well as the scenes at the bar and at a club where Derry and his wife are on a double date with Peggy and her date. The film’s music by Hugo Friedhofer and Emil Newman is wonderful for its serene orchestral score that play into the drama as well as eerie scenes of Derry’s own memories with some lively music from the music of the times. The film’s tremendous cast feature some notable small roles from Roman Bohnen as Derry’s father, Gladys George as Derry’s stepmother, Victor Cutler as Peggy’s date William Merrill during her double-date with Derry and Marie, Walter Baldwin and Minna Gombell as Parrish’s parents, Marlene Aames as Parrish’s sister Luella, Michael Hall as Stephenson’s teenage son Rob, Don Beddoe and Dorothy Adams as Wilma’s parents, Leo Penn as a scheduling clerk early in the film, Ray Teal as a man at the story Derry works at who makes claims about the war that upsets Derry and Parrish, and Hoagy Carmichael in a terrific small role as Parrish’s uncle Butch who runs a bar and plays piano at the bar. Cathy O’Donnell is fantastic as Parrish’s girlfriend Wilma who copes with Parrish’s isolation as she wants to help him and understand what he’s going through. Myrna Loy is radiant as Stephenson’s wife Milly who deals with her husband’s growing alcoholism while being sympathetic in his need to help other soldiers and giving Peggy advice about her feelings for Derry. Virginia Mayo is excellent as Marie Derry as a nightclub waitress that isn’t happy about the lack of major money coming from her husband as she becomes more eager to spend money and have fun rather than sympathize with her husband’s troubles. Teresa Wright is brilliant as Peggy Stephenson as Al and Milly’s daughter who befriends Derry as she learns about his post-traumatic stress disorder that eventually lead to her feelings for Derry and disdain for his wife Marie. Harold Russell is amazing as Petty Officer 2nd Class Homer Parrish as a sailor who lost both hands during a battle in the sea as he copes with being a burden over his mechanical hooks as well as the uncertainty of what to do next in his life. Dana Andrews is incredible as Captain Fred Derry as a bombardier with little skills who copes with not just finding work but also bad memories and being in a loveless marriage that is starting to crumble where he finds solace in Peggy though he knows it could mean trouble for his friendship with her father. Finally, there’s Fredric March in a phenomenal performance as Platoon Sergeant Al Stephenson as a former banker who copes with the aftermath of war through alcohol unsure of what to do until finding a way to help other soldiers despite having to deal with his bosses as it’s an understated yet engaging performance from March. The Best Years of Our Lives is a spectacular film from William Wyler. Featuring a great cast, a compelling story, gorgeous visuals, and a luscious score. It’s a film that explores post-war life where three men deal with the aftermath and the struggle to readjust themselves to becoming civilians again as it’s told with elements of realism as well as an air of earned sentimentality. In the end, The Best Years of Our Lives is a magnificent film from William Wyler. Great review on a film that I love! Brilliantly acted, directed, written. Filmed...amazing film. Sam Goldwyn wanted to win Oscars and his wife is the one that brought a story to his attention about the veterans returning from the war and the issues they are dealing with. At first Goldwyn didn’t thinkmthere was a film for this but his wife persisted and because of this, this film came to be. I've never see this but it sounds really interesting and definitely something I would watch. @Birgit-It was better than I thought it would be as I expected to be a typical but engaging Hollywood melodrama but it ended up being so much more. That's the good thing when you go into a film with low expectations as it could surprise you. @Brittani-It's a film that I think needs to be seen by a new generation of audiences. It's a three-hour film yet I was amazed into how it didn't feel like that at all and the pacing just breezed throughout so easily. That's the mark of a great film. This is one of my favorite Best Picture winners, definitely within my top five and perhaps in the top 3. Everything is just so beautifully realized from the situations that ring true to the seamless performances all the way across the board. You can tell Wyler had his training in silents since he understands the power of the visual as well as verbal. A perfect example is the wordless reaction of Homer's mother when he returns home and she sees his hooks. Her expression couldn't have been achieved in a million words of dialogue and it slays me every time. The film is crowded with such moments. I'm a big Fredric March fan and he's very good here but to me Dana Andrews gives the strongest, most compelling male performance in the picture. How the hell was he not nominated? He seemed to suffer from the same problem as Myrna Loy (also unbelievably never nominated for an Oscar), they were always good and more often than not exceptional. When that's your expected level of performance its hard to stand out and therefore you're taken for granted and overlooked. Unfortunate but back then not uncommon. A truly great picture with a timeless message which is why I think it has retained its reputation. I've recommended it to many people including some who insist they don't like black & white films (something I don't understand, a story is a story) and not one has ever told me they didn't like the film. @joel65913-Of the 59 Best Picture winners that I've seen so far, it's #35. I was surprised at how good it is and I agree with you that Dana Andrews and Myrna Loy don't get enough credit for what they did in the film. I don't understand anyone who doesn't like films in black-and-white. It's about storytelling. That's all there is. I watched this one the year before last and really enjoyed it as well! It's surprisingly modern in the way it's made but still a great representation of the time it was made in. @Mette-It's a film that was a surprise as I'm amazed at not just how good it is visually but also in how engaging it is as it still holds up after all of these years. Films like that are the reasons they're called classics if they can still connect with an audience more than half a century since it came out.